As Principal Solicitor of CM Lawyers, Christine brings over 20 years of experience and a wealth of knowledge to the areas of Conveyancing, Family Law ,Wills & Estates and Criminal Law. 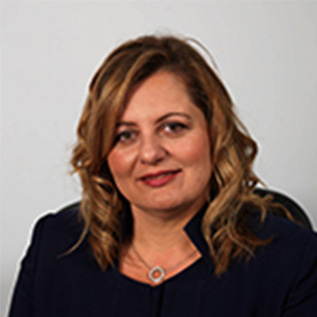 Establishing her own practice in 1996, Christine and her husband Alex Sapounas, have been working together to provide the Marrickville community with practical, relevant and winning legal advice. Alex’s background in finance and expertise as a Conveyancer, partnered with Christine’s strong local ethic and background in economics, ensure CM Lawyers are able to provide their clients with a fully comprehensive legal service. Appearing in courts across Sydney, Christine’s practice has a long relationship with the Family Court both in Sydney and Parramatta, the Federal Magistrates Court and various local courts. Christine is always up for a challenge, regularly attending seminars and training to keep abreast of the changing nature of the law. Fluent in Greek, with an associate solicitor in Greece, Christine is well-equipped for dealing with family or property matters amongst the Greek community. Christine also conducts talks and seminars for the elderly in the inner-west providing them with assistance in issues relating to Wills, Estates and Retirement Law.